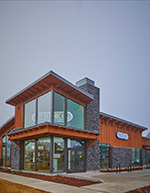 The new SELCO West Bend branch is a finalist for the 2018 Daily Journal of Commerce Top Projects 2018 in the "office" category. Now in its 23rd year, the DJC Top Projects is the premier awards program for the region's built environment, honoring the best building and construction projects in Oregon and Southwest Washington. See more about this project here. 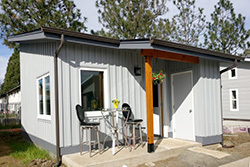 Mckenzie Commercial Teams Up With Nir Pearlson Architect To Build "Tiny House"
McKenzie Commercial teams up with Nir Pearlson Architect as a major donor to build a "tiny house" for the Square One Villages "Emerald Village Eugene." Located in the Whiteaker neighborhood, this project consists of 22 tiny homes complete with sleeping and living areas, a kitchenette and a bathroom. These unique homes will offer a permanent and affordable housing option for a diverse group of people with various backgrounds ranging from small families to senior citizens. This could not have been done without the large group of subcontractors, vendors and donors that came together to construct "Unit A." The Reality Kitchen flagship pretzel cart was in great need of multiple upgrades in order to make it fully functional. That's when Todd Glenz, President of McKenzie Commercial stepped in to lend a hand. Jim Evangelista of Reality Kitchen reached out to Todd to see how he could help. This created an inspiring opportunity for the community to pull together. Todd enlisted several subcontractors to help complete the many necessary upgrades. This new launch into the community will allow Reality Kitchen to continue to change the perception of how individuals who experience intellectual and developmental disabilities can contribute, as well as continue to educate and prepare these individuals to successfully realize their employment goals. Our thanks to: Summit Bank, Al's Sheet Metal, Rubensteins Contract Carpet, Harvey & Price, Harver Company, Allied Building, Eugene Builders Exchange, Acoustical Tile Systems, Reynolds Electric, Tom's Plumbing and McKenzie Glass. As Jim Evangelista said, "NOW THAT'S BUILDING COMMUNITY!" McKenzie Commercial Contractors, Inc. has ranked 8th in the small business category of the 23rd annual 100 Best Companies to Work for in Oregon. The Oregon Business 100 Best list recognizes large, medium & small companies for excellence in work environment, management and communications, decision-making and trust, career development and learning, and benefits and compensation. "Participating in this survey helps us stay competitive in the marketplace and recruit and retain quality employees", says Todd Glenz, President & Principal Owner. McKenzie Commercial ranked 7th in 2015, 12th in 2014, 3rd in 2013. For the third year in a row, McKenzie Commercial Contractors, Inc. was named one of the 100 Best Green Workplaces in Oregon, ranking 27th out of 100. More than 15,000 employees & volunteers from the for-profit & nonprofit sectors participated in the survey. "We consider it a privilege to be among Oregon businesses who are focusing on creating sustainable workplaces", says Todd Glenz, Principal Owner. The structural demolition of City Hall is now complete. Watch the video to see how we worked with the Project Team to reuse and recycle 95% of the existing structure. 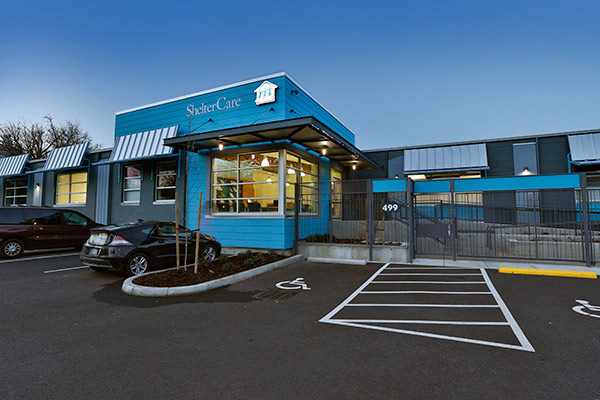 McKenzie Commercial Contractors, Inc. has been awarded 3rd place in the Renovation category of the Daily Journal of Commerce (DJC) TopProjects 2015 for ShelterCare located at 499 West 4th Avenue, Eugene, Oregon. The award was announced at the Oregon Convention Center on May 14. In 2009, McKenzie Commercial Contractors, Inc. won 1st place in the Renovation category ($5 - $15 million) for their work at University of Oregon Hayward Field. “It is a great honor to work alongside subcontractors, engineers & architects that go above & beyond each & every day to make the project they are currently working on their most important project,” says McKenzie Commercial Contractor Inc.’s principal owner Todd Glenz. Over 90 Oregon & Southwest Washington companies submitted projects for the areas of public buildings, private buildings, infrastructure, transportation & renovation. The DJC TopProjects has become an industry tradition, recognizing & honoring the best building & construction projects. The criteria consisted of projects completed in Oregon or Southwest Washington that were substantially completed by December 31, 2014, and valued at more than $1 million. Projects were judged based on materials submitted, scope of work, challenges and obstacles, budget & schedule considerations, quality, and overall project. For the second time in a row, McKenzie Commercial was named one of the 100 Best Green Workplaces in Oregon, placing 34th out of 100. More than 430 companies and nonprofits participated in this year's survey. As stated by Oregon Business Magazine: "As momentum grows at the state level to introduce far reaching environmental regulations, Oregon employers continue to go the extra mile to create green workplaces for their employees." We are honored to be considered among those companies that are making an effort to continue improving the community we all live it. McKenzie Commercial Contractors, Inc. has ranked 7th in the small business category of the 22nd annual 100 Best Companies to Work for in Oregon. The awards were announced at the Oregon Convention Center on February 26. McKenzie Commercial Contractors, Inc. ranked 12th last year, 3rd in 2013, and 17th in 2012. "What an honor to be named one of the top seven best small businesses to work for in Oregon," says McKenzie Commercial Contractor Inc.'s principal owner Todd Glenz. "We're lucky to have a great team of hard-working people who value our commitment to encouraging growth and promoting from within." The Oregon Business 100 Best List recognizes large, medium and small companies for excellence in work environment, management and communications, decision-making and trust, career development and learning, and benefits and compensation. More than 11,500 employees and 270 Oregon companies and completed this year's 100 Best survey. All the winners and their rankings are published in the March 2015 issue of Oregon Business and online at OregonBusiness.com..
As stated in Oregon Business Magazine, about McKenzie Commercial Contractors, Inc., "At construction sites, employees report a teamwork-driven environment that focuses on getting the project done." 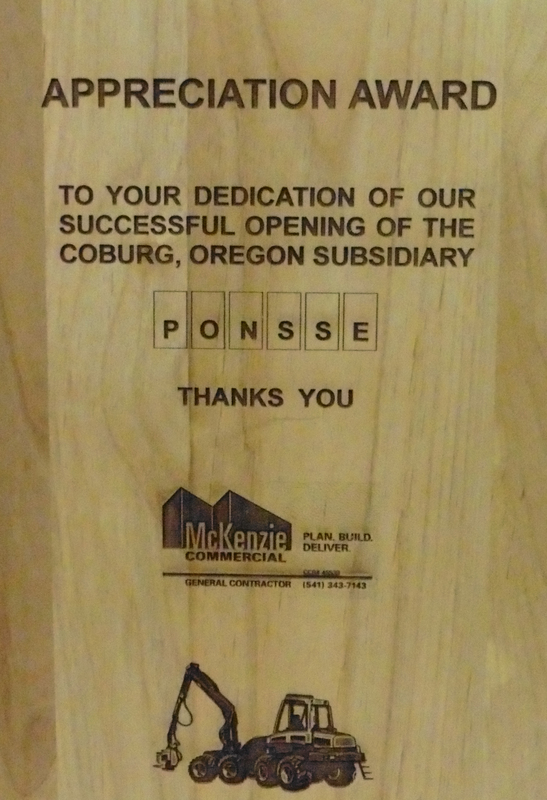 McKenzie Commercial received the 2015 Appreciation Award from Ponsse Corporation in recognition of the "dedication of our successful opening of the Coburg, Oregon subsidiary." Ponsse, one of the world’s leading manufacturers of forest machines, opened its 11,200 square foot sales and service center in Coburg in February 2015. 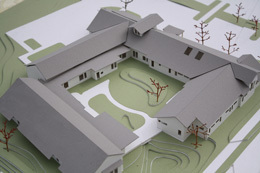 The new center will serve Oregon, Washington, Idaho and Northern California. Out of 400 Oregon companies and not-for-profit organizations, McKenzie Commercial ranked 60th. "I am proud to work for a company that places such a high value on sustainability," says one employee. We buy materials locally whenever possible to reduce the carbon footprint and we encourage employees to seek alternative methods of transportation. Staff is trained on recycling & conservation methods in efforts to cut down on waste & to continually make energy efficient choices. 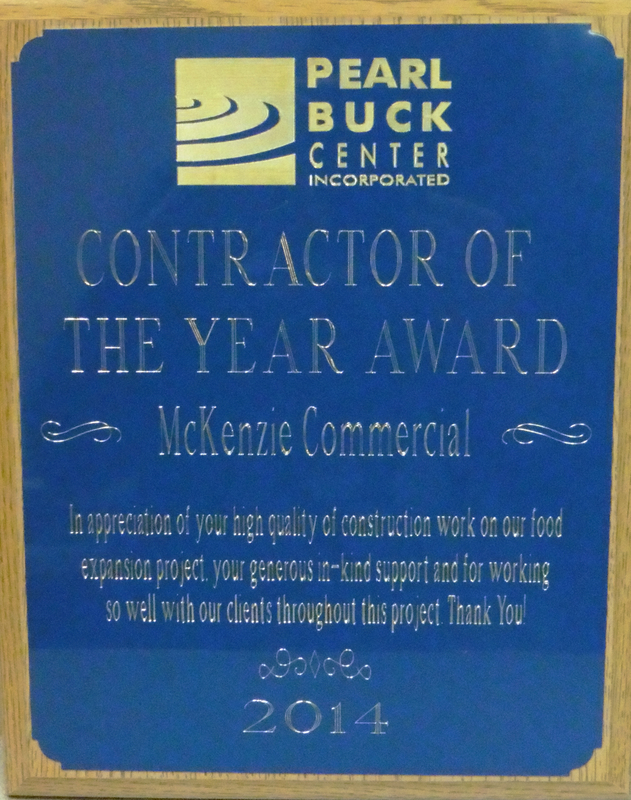 Pearl Buck awarded McKenzie Commercial as the 2014 Contractor of the Year. "In appreciation of your high quality of construction work on our food expansion project, your generous in-kind support and for working so well with our clients throughout this project. Thank you." Pearl Buck's mission is to "offer people with disabilities and their families quality choices and supports to achieve their goals." McKenzie Commercial has been ranked 12th in the small business category of the 21st annual 100 Best Companies To Work For In Oregon, as well as the highest ranking construction company. The 100 Best list recognizes large, medium and small companies for excellence in work environment, management and communications, decision-making and trust, career development and learning, and benefits and compensation. This year, 248 Oregon companies and more than 11,000 employees completed the 100 Best survey. The award was announced at the Oregon Convention Center on February 27. Last year, McKenzie Commercial ranked 3rd, 17th in 2012 & 12th in 2009. 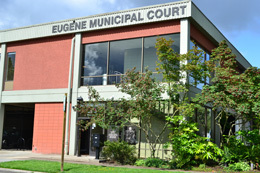 The City of Eugene has issued a Notice of Intent to award the contract for the Eugene City Hall Rebuild Project to McKenzie Commercial Contractors, Inc.
"As a Eugene-based contractor, we are thrilled to have been selected as the Construction Manager/General Contractor for this significant community project," says principal Todd Glenz. "We believe we are the best fit to represent the needs of the City and the community. We look forward to a successful partnership with the City, the architect and the community, to deliver a structurally sound, high-quality built City Hall that we can all be proud of." McKenzie Commercial has called Eugene home for 30 years. 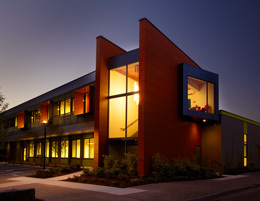 The company is knowledgeable of the local market and maintains an experienced team that has successfully completed over 100 projects within a six block radius of City Hall over the last 10 years, and more than 300 public agency projects within Lane County, including the recent remodel of the Municipal Courts relocation. 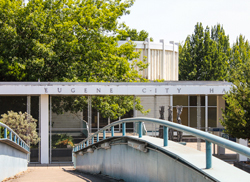 For the Eugene City Hall Rebuild Project, McKenzie Commercial has assembled a team that has worked together on renovation, remodels and seismic upgrade projects for more than 15 years, and will include LEED experts from the BrightWorks consulting firm. See the KEZI coverage of the story. 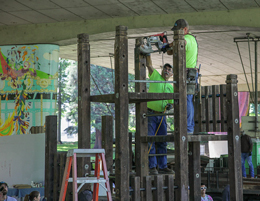 On June 8, 2013, McKenzie Commercial volunteered its time and skills to tear down the City of Eugene Washington-Jefferson Park play structure to make room for the new skatepark. Construction will begin this summer on what will be the largest covered skatepark in the United States. In an internal memo to City staff, Eugene Mayor Kitty Piercy said, "Last weekend I dropped by to watch McKenzie Commercial's volunteers take down the playground equipment at Washington-Jefferson Park in preparation for the upcoming Skate Board Park. They have helped us on many occasions and deserve our appreciation and gratitude. ... I have the good fortune of seeing so many good things that occur in our city all the time, and it is knowing this that encourages me and gives me confidence in our community's capacity for greatness." See KEZI and KVAL's coverage of Saturday's activities. McKenzie Commercial ranked third in the small business category of the 20th annual 100 Best Companies To Work For In Oregon. The Oregon Business 100 Best list is based on an anonymous employee survey assessing each company's work environment, management, communication and decision-making practices, career development opportunities, benefits and compensation. McKenzie Commercial also ranked 17th in 2012 and 12th in 2009. See KMTR NewsSource 16's story about the award. 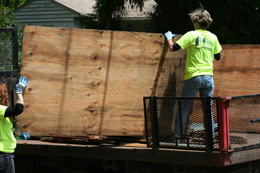 The honor is also mentioned on the Associated General Contractors website. Located at 21 W. Sixth Avenue in Eugene, OR and owned by Pacific Northwest Publishing, this $2.2 million project involved a complete interior and exterior remodel of an old, abandoned building in downtown Eugene. Now totaling 18,500 square feet, the renovated building required a use conversion to house new offices, a video production studio and warehouse facility. The project required meticulous craftsmanship in the execution of interior and exterior details.The job’s location and timing happened during a construction revival in downtown Eugene and garnered high profile media coverage, such as this article in The Register-Guard. During construction, a historical connection was made between the location of the building and the family ancestry of the building owners, Randy and Marilyn Sprick and their children, Matt and Jessica. Marilyn's parents were Japanese-Americans who were sent to an internment camp during WWII. The Pacific Northwest Publishing site was once where Japanese-Americans residing in Eugene were loaded onto buses to be taken to the camps. After two years at the camp, Marilyn's father, Roy Maeda, served in the U.S. Army's 442nd Regimental Combat Team, which became the most highly decorated regiment in the history of the U.S. armed forces. Learn more in this article from The Register-Guard on Dec. 6, 2011. At age 93, Maeda was belatedly awarded a Congressional Gold Medal by U.S. Sen. Ron Wyden, which was covered by The Register-Guard in this article on April 12, 2012. 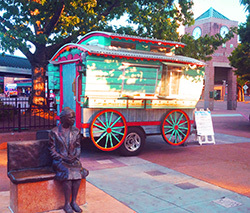 A public memorial for Japanese-Americans is located across the street from Pacific Northwest Publishing. This $2 million tenant improvement at 1102 Lincoln Street in Eugene, OR involved the conversion of 18,000 square feet of leased office space for the City of Eugene Municipal Court. The job required close collaboration between the building owner, tenant and contractor. The owner of the building hired the architect, while the tenant hired the structural engineer. We brought mechanical and electrical subcontractors on board and were charged with coordinating the project among these various parties. The project was launched with an aggressive four-month timeline. We completed it on June 5, 2012. Early in the project, while demoing a wall, we came upon a dusty, old wallet that we passed on to local newspaper columnist Bob Welch. We are constructing a new $2.6 million wood-frame building at 470 S. 42nd Street in Springfield, OR to house the expanding operations of a nonprofit agency that works to break the cycle of child abuse through education and support. Built with an energy-efficient design and ample natural light, the 14,500 square-foot building includes classrooms, offices, dedicated spaces for therapy and counseling, as well as a kitchen and public gathering spot. It is on track to be finished in February 2013. 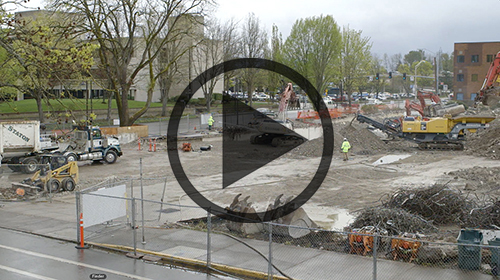 Visit Sladden Park at N. Adams Street and Cheshire Avenue in Eugene, OR, to see its makeover. 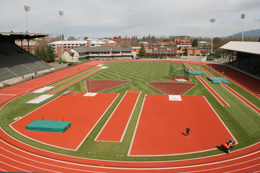 We completed an $8 million renovation of the University of Oregon’s historic track and field venue over two years in preparation for the 2008 U.S. Olympic Track and Field Trials. The project, located at 1580 E. 15th Avenue in Eugene, OR, included excavating and rebuilding the infield, resurfacing the track, adding new sound and lighting systems, and installing a state-of-the-art $270,000 video board. We finished the job in phases, timed to accommodate ongoing track and field events. The project required complex, underground electrical and drainage systems that included more than a mile of buried conduit and four miles of underground drainage lines.